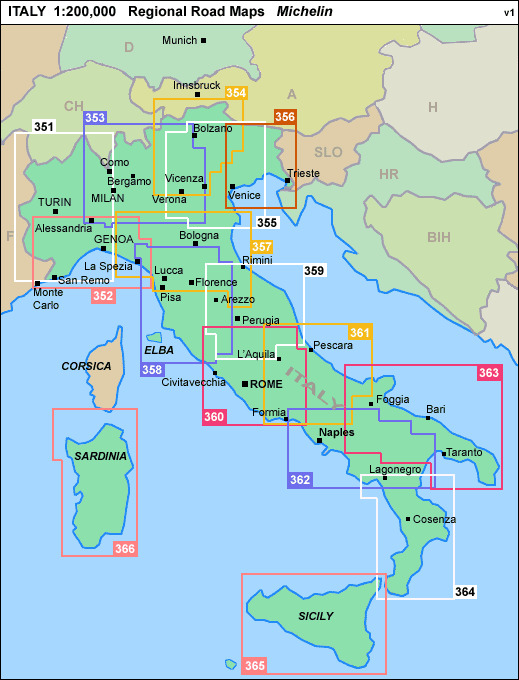 Includes enlargements of Bolzano, Trento and Merano, all separately indexed. 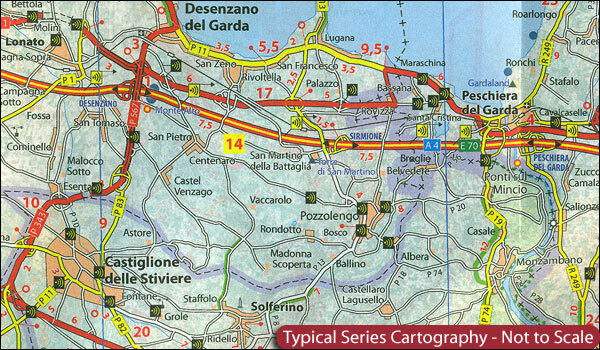 Indexed 1:200,000 scale regional maps of Italy with street plans of main cities. Topography is indicated by bold relief shading with spot heights and colouring for forested areas. Detailed road information, characteristic of Michelin’s maps, includes toll and free sections of motorways, road widths, difficult or dangerous roads, restrictions and seasonal closures, steep gradients, level crossings and fords, etc. Railway lines are shown with stations and car ferry routes indicate maximum tonnage. Also included is a distance/driving time table for quick and easy reference. Tourist information includes selected campsites, places of interest, scenic routes and viewpoints, sport and leisure facilities, etc. The maps have a grid showing latitude and longitude at intervals of 10’. The index of place name is next to the map; map legend includes English.